It's been time to renovate our corridor since a long time, but when my wife suggested also to pimp it up to make it a DIY electronics project, I finally agreed. When we decided to renovate the corridor, we also wanted to make it a bit more enhanced, fitting to our speaking smart mirror. On the floor, we wanted some wooden laminate but we also wanted some kind of night light that also works as an eye catcher at daytime. After looking around a bit, we found some aluminum profiles with acrylic glass over a gap fitting for some LEDs. So we wanted to get them around the corridor at every bit of wall, only sparing out the doors. We needed to cover about 7 m² of ground with laminate and about 7.3 m walls with aluminum profiles and LEDs. The laminate we got at a local store, the aluminum profiles and LEDs we ordered online. The aluminum profiles came in 2 m pieces so we ordered four of them and two spools of 5 m LEDs (ws2812b) from Aliexpress. Furthermore, a Raspberry Pi Zero, an SD card and some wires were needed. All in all the additional cost for the electronics on top of the base floor stuff been around 60 €. When we installed the laminate, we also had to plan ahead towards the LED circuit as the wall pieces needed to be connected. 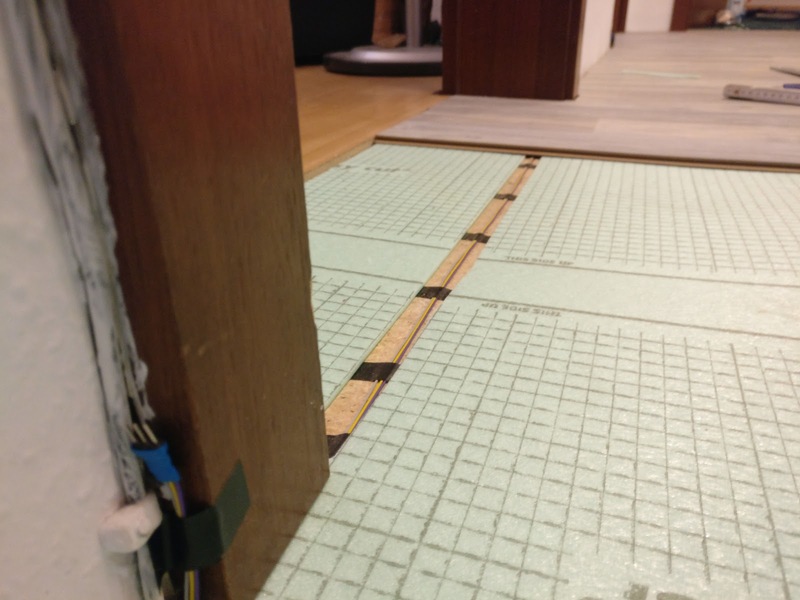 To achieve this, we were cutting some slots in the impact sound insulation below the laminate to place the cables within this and below the laminate, out of sight. 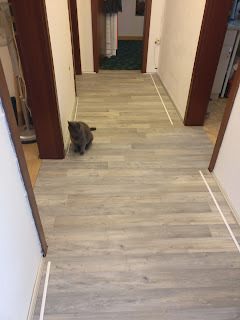 After the laminate was done (it was really no fun to cut out all the doorframes with a jigsaw), we had to cut the aluminum profiles for each piece of wall and glue them into place. The LEDs have been cut as well and placed within the profiles. Then the cables had to be soldered to the LED stripes. All the LEDs are powered by a single Raspberry Pi Zero. You can see some flickering at the end when the brightness is turned to full 255, but actually, we are running it at 20 only and that's still a bit too bright in the night. For the casing, I designed a case in Onshape in two pieces, one that is placed on the wall and holds the electronics, the other part can be slid off to access everything. I was also installing an IR movement sensor to switch on the LEDs when someone enters the corridor. They will be switched off again when no movement was detected for 90 sec. 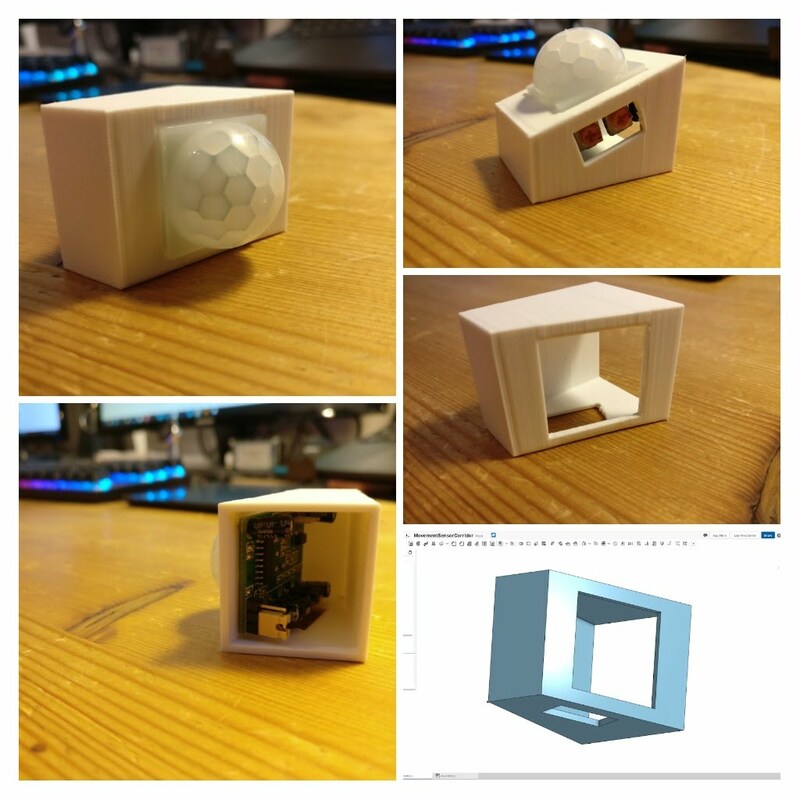 For this sensor, I was designing and printing a case as well. This way it was easy to place it close to a wall, but keep it facing a bit more towards the floor and the doors close to the sensor location by adding a 20-degree angle. The adjustment screws are still accessible as well. All in all, the installation looks quite nice now. After all the work, the result is quite impressive. I will show a video here but believe me when I tell you, it looks a lot more amazing in real life (it's hard to capture light as the main motive at a video). Also, I added an animation when the LEDs are switched on and off. For the on animation, I slowly raise the brightness till the set default value (20), then extend it a bit and let it fall down to the default again. For the off animation, I simply lower the brightness step by step until it's off. 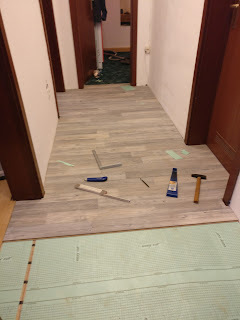 Regarding color, we decided on a turquoise, as it fits really well to the grey laminate and is a color we actually like. It's been a fun project and the result looks amazing. I might also change the code a bit to show a different color at night, more towards red or orange. This way it might be a bit easier on the eyes in dark environments. 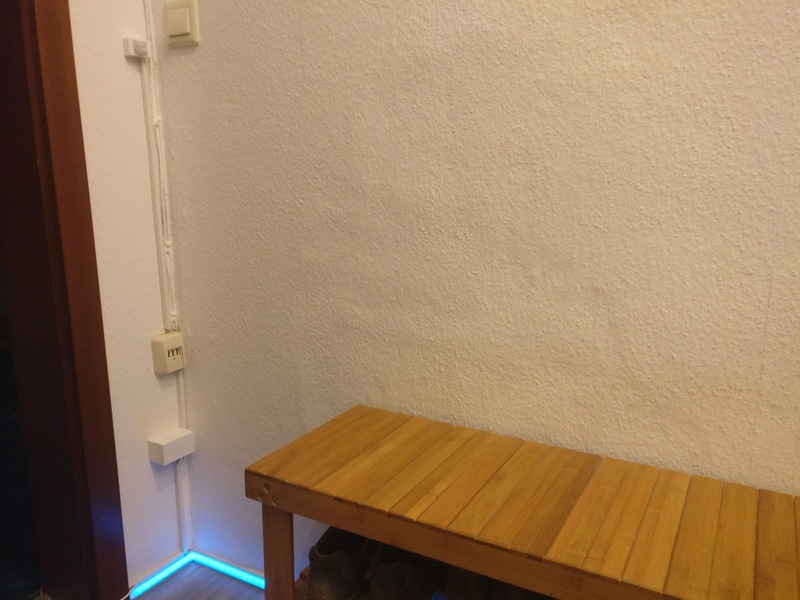 I am even thinking about installing a little light sensor as well to control the color not only by time but by actual light conditions. 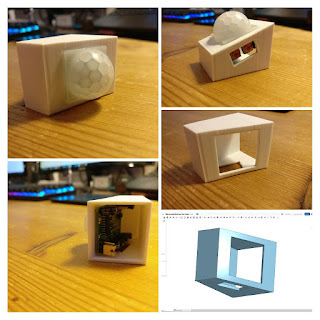 The 3D printer has been a great addition to small projects like this as it opens worlds of new opportunities to get the right parts just for your specific needs. 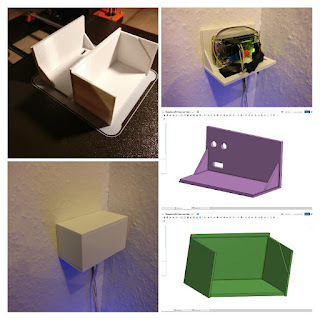 I also did some other home projects with electronics and the printer already and more will follow, for sure.